Congratulations to all partners and colleagues with the upcoming international women`s day March 8! polyamide tube and tubing market. 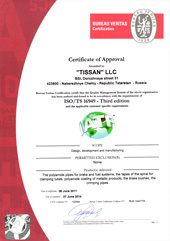 ООО Tissan (Tissan LLC) is an enterprise with a high level of manufacturing culture, successfully competing in the market of the Russian Federation and the far abroad. The Company`s products are supplied to such vehicle manufacturers as KAMAZ OJSC, AUTOVAZ OJSC, GAZ Group, UTES OJSC, UAZ OJSC and others. By clicking on the button and sending information, you consent to the processing of personal data. Address: Russia, 423800, Republic of Tatarstan, Naberezhnye Chelny, BSI, Melioratornaya Street, 15.